Carelabels is a Yorkshire (UK) based company. We specialise in the manufacture of printed care labels for clothes and other fabric items. We aim to cater for a wide range of customers, from those wanting thousands of labels for designer garments to those who just want a few for labelling their craft or sewing projects. If you make a lot of items for sale you will understand the need for labelling and the importance of branding for your business, but you might not have considered this if you are just starting out. With all the excitement of developing and making your products labelling probably won’t be the first thing on your mind. However, it will invariably be a requirement if you are bringing your goods to the market. Usually a simple wash care and content label will be sufficient to start with, but your local Trading Standards office will be able to advise you if you are not sure exactly what you need. CE and/or safety labelling is generally required for children’s toys and some clothing so this is something to be aware of. All of our labels are bespoke so we can work with you to add whatever information you require to prepare your products for sale. You have a choice of care labels. 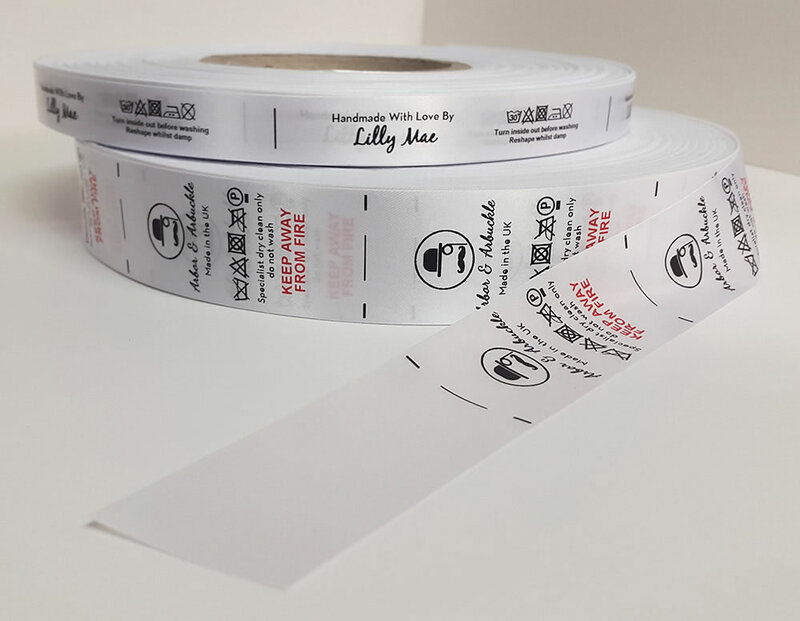 Loop Fold Care Labels – This type of label is designed to fold in half as a loop with 10mm sew space at each end so that it can be sewn into a seam. Both ends will need to be sewn in to avoid fraying. The printing ink is applied to one side of the fabric. Typically we would print your branding on the upper portion of the label and washing/care instructions on the lower portion so that, once folded, the branding will appear on the front of the label and the washing/care instructions will appear on the reverse. Generally these labels will be supplied un-cut on a roll and you can simply cut them off as needed. Fabrics are available in white, cream and black polyester satin in a variety of widths. 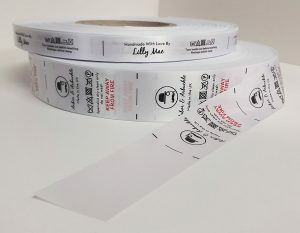 1 or 2 Sided Care Labels – These labels are supplied with cut and sealed ends so they will not fray and you will only have to sew one end into a seam. New legislation requires that care and content information is shown in the language of the country the goods are being sold into. Obviously if you are selling into multiple countries you may need to add several translations. A 2 sided care label is ideal for this. We print on both sides of the fabric so you can keep the label size to a minimum. We can supply labels in booklet fold format to give you a short, neat label. Fabrics are available in white and black polyester satin. For more information on care labelling guidelines take a look at the Textile Labelling Regulations from the Department for Business Innovation & Skills. We use a digital printing process with a computer based design package. This means that when you come to choose the font styles for your labels you can be as imaginative as you like with your branding. 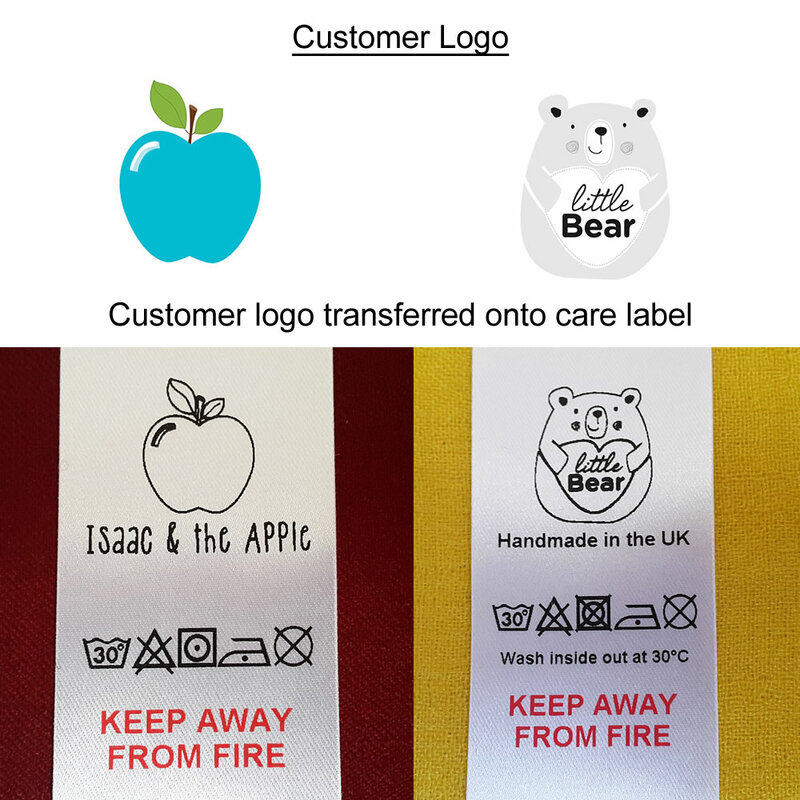 We would usually suggest using something clear and simple (Arial or similar in style) for your care label font to make washing instructions and safety information as clear as possible for your customers. Just let us know the washing instructions in words and we will add the corresponding symbols. Here is a useful link to www.care-labelling.co.uk where the symbols and meanings are explained. Once you have chosen your care label font you may wish to add a logo/image to make your labels a little more individual. We have a wide range of logos/images on file which may be appropriate for you. To choose your care label logo from our selection just let us know the sort of image you would like and we can show you some options. If you spot something on our website just point it out and we can add it for you. A lot of the images we have can be filled with a colour to make your care label logo really stand out. We have a selection of ink colours for you to choose from on the website. Rather than adding one of our logos/images you can choose your own care label logo. Just send us your image file and we will check to see if it is suitable for printing. A high resolution jpg is ideal. Simple graphic images work best. We can add up to 3 ink colours to your label. CE labelling is required if you are making and selling soft toys into EU countries. As the manufacturer/seller you will have to make sure that your products conform to EU safety legislation. You will need to complete the CE self-certification procedure in order to use the CE mark. Once you have done this we can add CE information to your label. You will usually be required to add contact details for traceability and relevant safety information/warnings. We can also add batch numbers if required. For more information on responsibilities for toy manufacturers visit the Gov.uk website. As part of the CE labelling process you are required to make sure that your products meet safety requirements. The printing inks and fabrics we use have been independently tested for toxicity (EN71-3: 2013) to make sure that our care labels conform to EU legislation. We can supply a test certificate for your records. Over the years we have put a lot of effort into researching and developing our products. The fabrics and inks we use have been thoroughly tested and carefully chosen with the aim of maintaining quality. Your care labels are locally sourced. We have a fabric supplier just 4 miles away from our Yorkshire base and our ink supplier is in Wales. We like to develop relationships with local suppliers wherever possible. Once you have sent us your ideas we will work with you to design and create your own customised labels. The digital printing process and computer based design package we use enable us to change layouts quickly and send you images for approval as we go through the design process with you. When you have approved your design it will be sent to our printer. 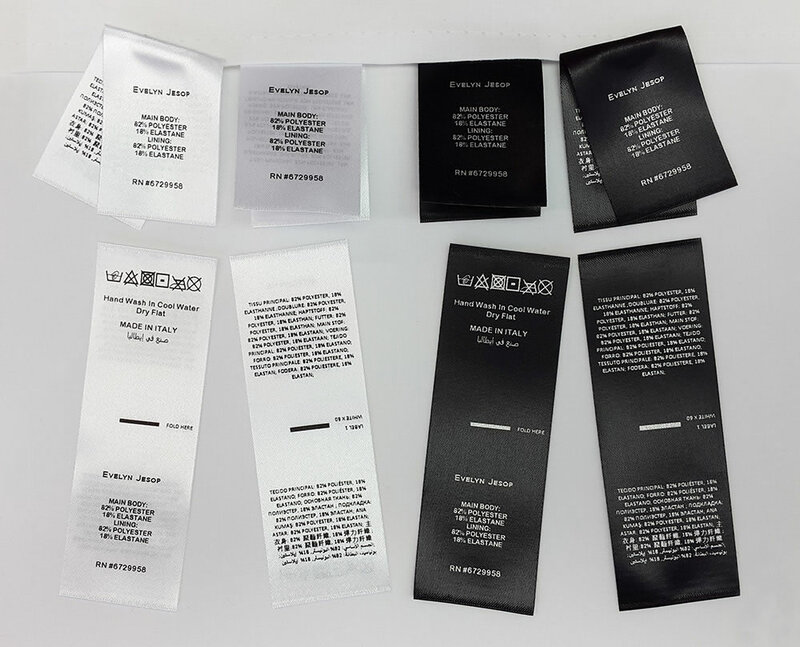 The inks are applied to the label fabric using a thermal transfer process. If you would like to see how your care labels are printed please have a look at this video. Here are some examples of care labels printed for our customers. Both of these original logo designs were supplied by our customers then edited to make them suitable for printing. Simple graphic designs like these work extremely well. Fine details will look ok on paper but will often be lost when transferred to fabric. This is something to bear in mind when designing your care label logo. Speed of delivery and our endeavour to provide excellent customer service have become key features of our business. 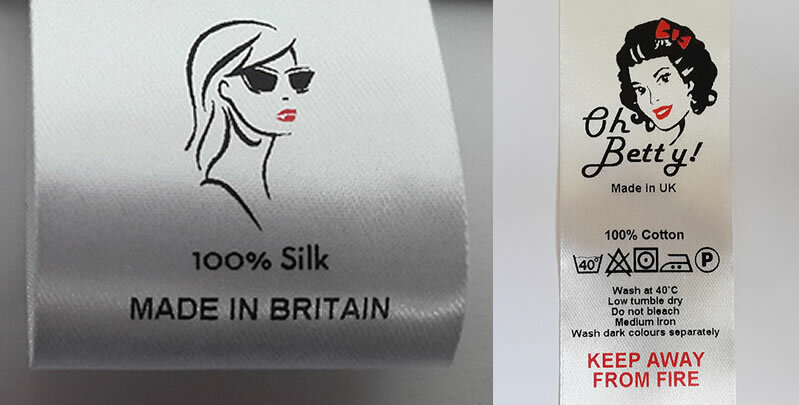 All of our labels are made on site in our UK office so we have complete control over production and quality. If you need something urgently it’s not a problem. We will always try our best to meet your schedules. Your care labels will usually be shipped within 24 hours of design approval. We ship care labels across the EU and worldwide. All UK packages will be sent by Royal Mail 1st Class post or Royal Mail Special Delivery/courier if time critical. EU/worldwide packages will usually be sent by Royal Mail Airmail. A courier service may be available at extra cost. If you are interested in care labels for clothes or other items please feel free to contact us. Use the form below and we will call you back. For immediate assistance call 07787 177833. If you have a design and style in mind please provide as much information as possible (e.g. your choice of care label style, care label font, care label logo, CE information if required) to enable us to design and print your labels promptly. If you have any questions at all please contact us and we will try to help. If you have questions or would like to place an order please use the enquiry form or call our service team on 07787 177833 (Mon-Fri 8am-7pm).